Here’s one for our middle-grade readers…Although adults will enjoy it too! 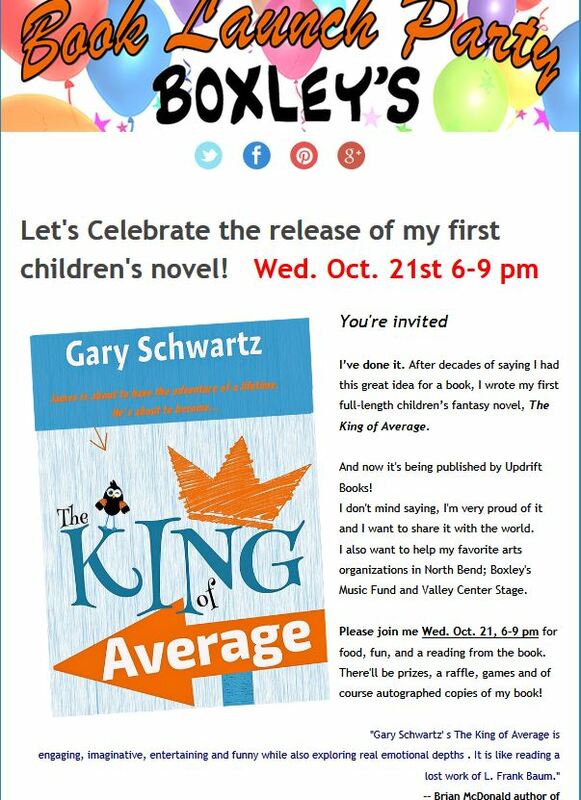 THE KING OF AVERAGE by Gary Schwartz is released on Amazon and you can attend Gary’s King of Average release party at Boxley’s on the same evening as Sheri J. Kennedy’s Likeness release party at Pioneer Coffee. Make Wednesday, October 21st a Literary Night Out in North Bend, WA starting at 6:00pm! I am delighted to have had the chance to be an ARC reader for this book. What fun! 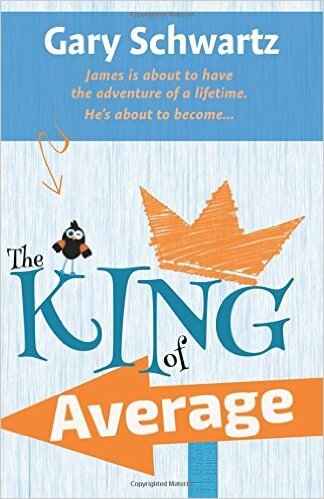 THE KING OF AVERAGE ranks high above the average read. The clever wordplay and humor are noteworthy, but my favorite thing about the book is its old-fashioned sense of story. And I don’t mean the ‘old-fashioned’ that’s dusty and crusty and drear. I mean that fantastic and currently rare quality of creating an atmosphere that’s so vivid you can step inside. The story comes to life before your ‘eyes’. Vibrant and sometimes zany characters swept me away as I traveled with the very relatable and sensible James. I often review on an author’s mastery of Voice, but in this case I’d have to say Schwartz has mastered ‘Voices.’- perhaps due to his extensive experience in television, film and theatre. I can hear each character speaking, as if a play was going on in my head. This is what I mean by ‘old-fashioned sense of story.’ It breathes without need of digital media. Though I can hardly wait to hear an audio book of this…especially if Schwartz reads it himself! While I have harped on the rich story traditions that tie to the past, I must say the theme and moral of the story, woven through in the most enjoyable puns, are completely contemporary and valuable to both children and adults alike. It’s a rewarding journey to see James blossom, and a great reminder to keep moving forward on this wonderful journey we call life. This entry was posted in Community, Events, New Release and tagged childrens books, Gary Schwartz, middle grade books by freevalleypublishing. Bookmark the permalink. Wonderful! I’m in the middle of working on a middle grade fantasy book as well! Would love to snag a copy of your book and take notes. It’s about 2 blocks from my event where you’ll be, Rachel, so yes! Go see Gary tomorrow night too! I hope that is a big night for all! Best of luck. I Tweeted.